The winner of the $150.00 Spa Gift Card is DG! Congratulations and enjoy! Imagine that you’re having the kind of day where you feel like you’re coming down with a cold. You’re feeling run down. Sitting around in sweats. So far, your excitement for the day has been twitter. Then unexpectedly, you get a delivery! A whole box filled with wonderful sweet treats! That’s what happened to me. Instantly I felt better! Giddily, I started trying them. I don’t remember the order. There was such an assortment to taste. The Petite Pirouette® is a delicate, crispy rolled wafer with creamy, chocolaty filling on the inside. Try either the chocolate hazelnut or chocolate crème flavor - or both! I tried them both and cannot even convey to you how much I like them. You know what? Actually, I can. I had planned to share a lot of these with other people. After all, I had so many. Well, I shared a few, but over several days kept eating them myself and decided not to share most of them. I know. That’s kind of wrong. My absolute favorite of all of these are the Petite Pirouette chocolate crème. And if not sharing these is wrong, well I don’t want to be right. These are incredible! 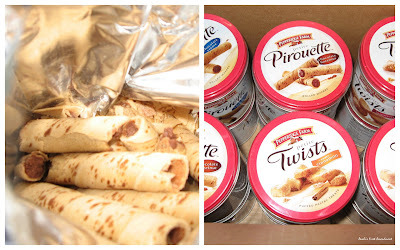 And three Petite Pirouette rolled wafers add up to only 90 calories! The Petite Twists® puffed pastries have layers of delicate, crisp pastry swirled with sweet cinnamon or raspberry. Another nice treat with just 90 calories in two of the twists! These are quite good too. Very crispy, so they are good for dunking. If you’re a dunking kind of a person. Not all of us are. However, all of us do deserve some luxury in our lives. Even if only for a few minutes. Petite Pirouette and Petite Twists are a great way to indulge yourself. Now the ultimate way to lavish ourselves in comfort is to go to a spa. In this economy, not many of us get to go to one. So how would you like the chance to win a $150 Spa Gift Card? I know that I would! Well, BlogHer and Pepperidge Farm are giving you the opportunity to win. All you have to do is leave a comment stating what you’d like in a fantasy spa getaway. Would you like to go to a tropical seaside resort? Maybe a combination spa and ski resort in the mountains? Even a day at home with no housework and a masseuse comes to you. Just tell me in the comments. This giveaway is open to US-residents, aged 18 and older. And remember to check out all the other reviews too. You have 7 chances to win! If we're talking fantasy, let's make sure there is an infinity pool, private hot tub, massage, and delicious food. A fantasy spa day for me would include a long and slow massage, a whirlpool bath and pampering on the face: eyebrow shaping, massage, skin treatment. A day to myself would be a day to finish all those little projects I have started but ran out of time an energy to complete. My scrapbooking would be up to date and my house would be organized. I don't care where the spa is, but I would want a full body massage, a scap massage, mani, pedi, facial, well, the works, really. Wow, wouldn't that be a dream? Well a great day for me would be if I found out I won this spa day, wow a day away from the laundry, cooking, driving kids everywhere and cleaning. Thank you for this contest. Tropical seaside resort sounds great! I love the sound of the waves lapping the sand on the ocean. I like the idea of the ski resort/spa treatment...no chores, no errands...sounds divine!! I'm with you Abigail! Massage in Tahiti sounds amazing. Honestly, I would take a massage at a local spa. Great giveaway. My fantasy spa getaway would involve a tropical island, an infinity edge pool, a huge umbrella, and lots of drinks with umbrellas in them. My fantasy spa getaway would involve going to a tropical island, a massage and some fruity drinks. would be to have my 16 yr. old daughter with me! She might even say two words to me. Now that would be a great day!! For sure I would like to win that! I'd love to go to an oceanside resort with my husband! I would love to go to a fantasy spa with my husband wher we would spend days walking the beach, eating amazing food--and at night while we slept they performed magical procedures that make us look and feel fabulous. A tropical seaside resort would be awesome for a spa getaway with DH! I would love a massasge on the beach with some champagne. My fantasy spa getaway would be at an exotic beach getting pampered with massages and getting fed grapes by hot men! My fantasy spa giveaway would include lots of pampering and good wine, wherever the destination! A seaside resort sounds wonderful! I would like it to serve mostly raw food desserts..I luv them. Drinks with little umbrella's in them and have a massage. Go horseback riding on the beach and eat lots of seafood! Perfect..Oh and don't forget my hubby..he would like a golf course too! spa resort in maui all by myself sounds like heaven! i would take a surfing lesson and snorkle and lie on the beach and read. Tropical sea-side resort is my idea of fantasy spa time, some soft tropical music playing, smell of the ocean, palm trees swaying, Oh yeah, That's me! A spa fantasy in my mind is always sea-side - the more tropical the better! I can hear the waves crashing the beach as I am relaxing with my massage and I can smell the sweet smells of paradise as I am receiving my body wrap & facial! Love, love to sleep through it all. A nice massage, a manicure, hot, scented bath, and a good book--love it! A spa day with a great massage at a luxurious vegas resort would be nice. A private home on Kauai's north shore would do it for me. A little place with a hot tub, near the beach with waving palm trees and rainbows around. I'll take some of the food with mine please. Well a massage, facial and pedicure, nearby so I dont have to drive far, is really all I need. I'm easy to please! The scene: Poolside massage. It is so quiet, all you can hear is nature and the light breeze. The water in the pool is so calm, you can vividly see the reflection of the sun setting behind the mountains. Okay, that's my fantasy. Reality says that I'd be thrilled just to get out of the house long enough to get a massage or pedicure! I'd love to kick back, relax, have a few glasses of wine and take a nice, long bubble bath. Would love a spa gift card..ahhh..how nice! Thanks Pepperidge Farm! Best treats ever. My family grew up on PF cookies and crackers. Nothing beats it. Since you're talking fantasy- my spa would be one where the 10 pounds I'd like to lose would automatically be removed from my body when I walk through the door. And my muscles would be toned just by eating sweet fruit treats while laying around the pool. Now if we could just get Pepperidge Farm to go gluten free. I can just imagine a Double Chocolate Milano and a few other fabulous cookies. I think my fantasy giveaway would be to go to one of those cool resorts in Fiji where the rooms are over the water and the spa services come to your bungaalow as you look out over the ocean! I have seen Fiji in movies and have always dreamed of going. A yoga class then a hot stone massage. Follow that with a soak in a hot tub with a great view. Sip some wine, eat some delectable food, then read a good book. All this with a strict no cell phone policy. My fantasy spa getaway would definitely be on a tropical island w/white sand beaches & lots of sunshine! Sunshine and sand and an ocean for yoga in the morning. Fine food beautifully prepared and elegantly served - all low fat low cal and delicious. A facial then a hike then a massage then a consult with a nutritionist. A spa fantasy vacation for me would definitly be a seaside resort, with massages, facials, and of course delicious, healthy food. When I think of spas I think of a good view with feet up. So some tootsie pampering on the ocean would be just about perfect. Since I can't relax by eating the cookies (I'm gluten-free and MISS Pepperidge Farm) I would love to have a day to myself! drgingercarter at yahoo dot com. I want to go to Costa Rica, so I can go hiking in the rainforest during the day, then come back, have a lobster dinner, get a massage and a facial, and drift off to sleep. I'd love a day at the spa filled with a facial, seaweed wrap, hot stone therapy, and of course a really nice massage. Oh, my! Let me see here, where do I begin? lol... It would have to be somewhere tropical, perhaps Hawaii or even better the Mediterranean Seaside! Blue waters where I could have fun during the days; maybe a cute local can teach me boating **wink**, do a little dancing, shop the boutiques and then have spa-fabulous afternoons with facials, massages, wraps, and a complete makeover from head to toe! Buy hey that's just my fantasy spa vacation! Ah, heaven!! lol.. Thanks for your entries everyone! These comments have been fun to read. I'll be drawing the winner soon and will announce within a few days.